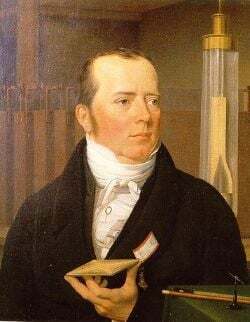 Hans Christian Ørsted (spelled Oersted when the Danish letter Ø is unavailable) (August 14,1777 – March 9, 1851) was a Danish physicist and chemist. He created an upheaval in the world of science by discovering that an electric current produces a magnetic field. For him, this discovery confirmed his belief in the unity of nature. Hans Christian Ørsted was the son of Søren Christian and Karen Hermandsen. Ørsted developed his interest in science while working as a young boy for his father, who owned a pharmacy. He and his brother, Anders Sandøe Ørsted, received most of their early education through self-study at home. In 1793, they went to Copenhagen and passed the entrance exams for Copenhagen University. The brothers distinguished themselves academically at the university. In 1797, Ørsted won a gold medal from the university for his paper, "On the Limits of Poetry and Prose." The next year, he captured another prize for a paper on a medical topic and passed his pharmaceutical examinations. He was awarded a doctorate in 1799 for his dissertation, "The Architectonicks of Natural Metaphysics." In 1801, Ørsted began investigations with the newly invented electric battery of Alessandro Volta and published some observations on acids and alkali generated by an electric current. That same year, he received a travel scholarship and public grant that enabled him to travel through Europe for three years. In Germany, he met Johann Ritter, a physicist who believed there was a connection between electricity and magnetism. That concept made sense to Ørsted, as he believed in the unity of nature and saw the possibility that most natural phenomena could be interrelated. Their conversations drew Ørsted into the study of physics, and Oersted translated one of Ritter's works into French as a favor. Unable to immediately obtain a chair in physics, Ørsted continued his experiments and lectures, supported by a grant from the state. In 1806, he was offered and accepted a professorship at Copenhagen University. There he continued his research with electric currents and acoustics. Under his guidance, the university developed a comprehensive physics and chemistry program and established new laboratories. In 1809, Ørsted published the first edition of the Manual of Mechanical Physics. The work was updated in 1844. He took another excursion about Europe in 1812-1813, and published Views of the Chemical Laws of Nature. Upon returning in 1814, Ørsted married Inger Birgitte Ballum. They became the parents of three sons and four daughters. Through the remaining years of the decade, he continued to lecture and further investigate the phenomenon of electricity. Ørsted noted several observations that supported the belief that some connection would be found between electricity and magnetism. He observed, for example, that a bolt of lightning can change the poles of a compass. He also noted that an electric current produces light and heat in a wire. He therefore felt that a more substantial connection between electricity and magnetism would eventually be uncovered. In 1820, as he was preparing for an evening lecture, he attempted to show the possible connection between electricity and magnetism. The success of his demonstration was a surprise to him. As he was setting up his apparatus, he noticed a compass needle deflected from magnetic north when the electric current from the battery was switched on and off. This observation came as a surprise, but it convinced him that a wire carrying an electric current radiates magnetic fields from all sides, and it indicated a direct relationship between electricity and magnetism. It should be noted that Ørsted was not the first to discover the interrelatedness of electricity and magnetism. Gian Domenico Romagnosi, an Italian legal scholar, made this discovery 18 years earlier and it was published in an Italian newspaper in 1802. That discovery, however, was overlooked by the scientific community. At the time of his discovery, Ørsted did not have a satisfactory explanation of the phenomenon, nor did he try to place it in a mathematical framework. Three months later, he began more intensive investigations. He published his findings soon thereafter, proving that an electric current produces a magnetic field as it flows through a wire. When opposite electrical powers meet under circumstances which offer resistance, they are subjected to a new form of action, and in this state they act upon the magnetic needle in such a manner that positive electricity repels the south, and attracts the north pole of the compass; and negative electricity repels the north, and attracts the south pole; but the direction followed by the electrical powers in this state is not a right line, but a spiral one, turning from the left hand to the right. Ørsted's findings resulted in intensive research throughout the scientific community in electrodynamics. They influenced French physicist André-Marie Ampère's developments of a single mathematical form to represent the magnetic forces between current-carrying conductors. Arguably, his discovery paved the way for modern telecommunications, which is based on the relationship between electricity and magnetism. He was held in high esteem by his contemporaries, in both the political and scientific spheres. Ørsted's activities were not confined to scientific research. He took an avid interest in the literature and politics of his time. He was a co-founder of a literary journal that circulated between 1829 and 1838. He composed a lengthy work of poetry in the lyric style called The Balloon, which was translated into German. He was known to promote the liberal political movements of his time within the constraints of his primary profession of teaching and lecturing. 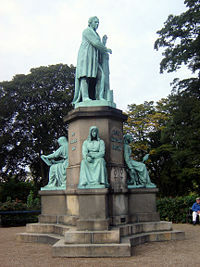 In November of 1850, his life of service at the University of Copenhagen was celebrated, and notables from around Europe came to take part in the jubilee commemoration. In early March, 1851, Ørsted contracted a cold, which did not at first appear serious, but later led to rapidly declining health. He died on March 9 of that year, and was buried in the Assistens Cemetery in Copenhagen. Today, the buildings which are home to the Department of Chemistry and the Institute for Mathematical Sciences at the University of Copenhagen, are named The H.C. Ørsted Institute in his honor. In honor of his contributions to the field of electromagnetism, the cgs unit of magnetic induction is named oersted. Oersted carried out some novel measurements of the effect of pressure on the volume of liquid water based on the principle that reducing the surface area to which a force is applied multiplies the pressure. He was, as a result, able to take measurements by using only moderate forces in his experiments, and established that the change in volume is proportional to the pressure. In 1825, Ørsted made a significant contribution to chemistry by producing aluminum for the first time, although in an impure form. 1852. Lives of the Illustrious (The Biographical Magazine). London: J. Passmore Edwards, Vol. II, 297-310. Oersted, Hans Christian. 1852. The Soul In Nature, With Supplementary Contributions. trans. L. Horner and J.B. Horner. London: Henry G. Bohn. Oersted, H.C. 1821. "On Electromagnetism." Annals of Philosophy II:321-37. Oersted, H.C. 1823. "On the Compressibility of Water." Annals of Philosophy V:53-56. Hans Christian Ørsted. Corrosion Doctors. History of "Hans Christian Ørsted"
This page was last modified on 27 July 2017, at 22:48.